Providing very high quality mobility services. Reinvigorating a city transit system that is plagued by traffic jams. Proudly defending the legacy of a type of transit that is a one-of-a-kind. The Hong Kong tram, with its double-deckers, has become a symbol of the city. It celebrated its one hundredth anniversary in 2004, yet still looks as young as ever. 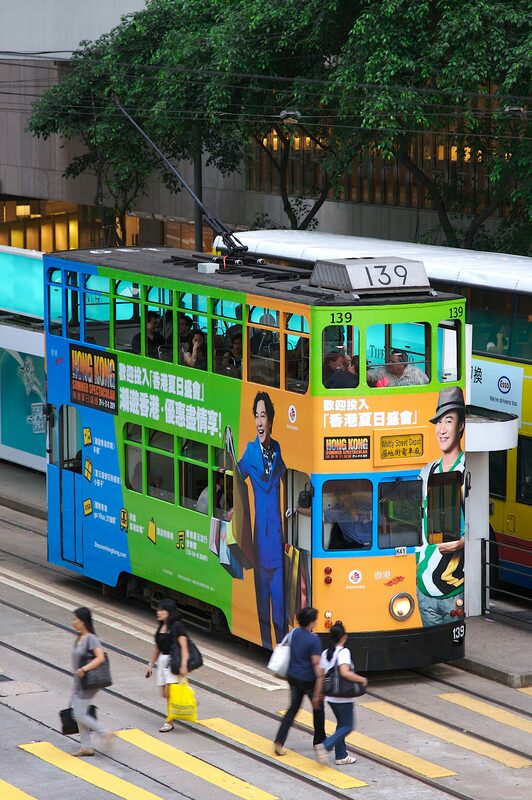 Hong Kong locals are particularly fond of their tram, the subject of many a childhood memory or family anecdote. It has garnered the affectionate nickname of "Ding Ding". The tram's main challenge is to transport 200,000 passengers every day in one of the most densely populated cities in the world. All the while, it remains one of the most environmentally friendly forms of transportation. To meet passengers' ever-increasing mobility requirements, real time traffic information was launched online. Signage was also overhauled with a new logo. Additionally, an app was created to help users learn more about the traditional neighborhoods that lie along the tram line. Traveler safety is a core concern of Hong Kong Tramways. The braking systems have been improved and a controls center has been created to regulate traffic. Hong Kong Tramways is also one of the only transit systems in the world to manufacture its trams locally. The fine-tuned process deftly combines tradition and modernity, legacy aspects and high-tech adaptations. The TramOramic Tour is a member of RATP Dev's sightseeing alliance, Extrapolitan. Since 2016, it has helped tourists discover the city aboard an elegant vintage 1920s-style carriage. All aboard for an unforgettable experience! "Hong Kong locals are particularly fond of the tram they affectionately call the Ding Ding, an integral part of Hong Kong."